Tables can be the most frequently used pieces of furniture in your home. This is why table repair and restoration is important to any home or property owner. 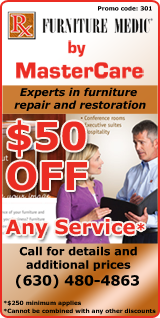 Furniture Medic by MasterCare Experts, Naperville and Aurora, IL are the experts to turn to when you are in need of table repairs. They can assess the damage to your wood tabletops and fix any defects such as scratches, dents, watermarks, burns and gouges. For professional table repair services in Naperville and Aurora, IL area, call Furniture Medic by MasterCare Experts at (630) 480-4863.